The Millstone, which was built in 1892 as an eight-bedroom inn on Highland Road, near Cape Cod Light, became part of the Cape Cod National Seashore in 1961. 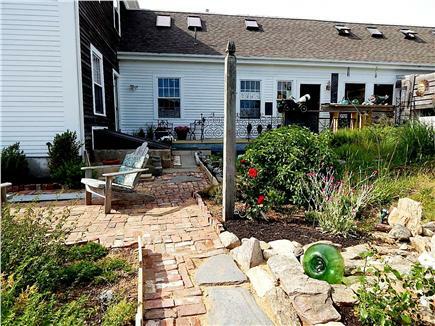 Owners of the well known Mediterranee Restaurant on Pond Road soon bought the building and moved it to its present location at 9 Pond Road, a 5-minute walk to Cold Storage Beach on Cape Cod Bay. 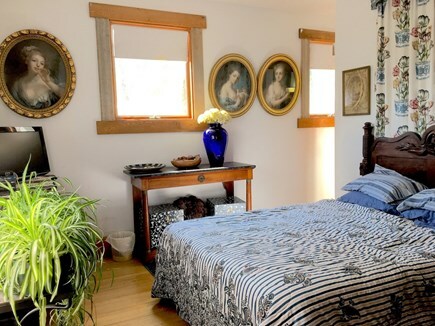 Over time the present owners Sam Adams and Scott Ashley have decorated the historic building with unusual furnishings, beautiful artwork, and modernized baths. They have landscaped the grounds with dune and love grasses, rock sculptures, and inscribed granite slabs. 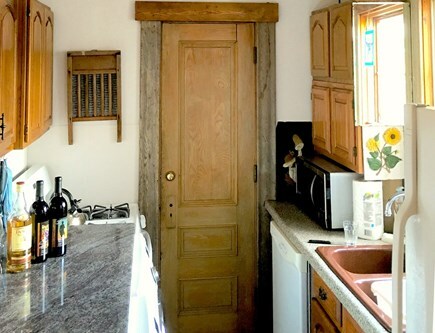 The Millstone is an owner occupied multi unit home: it's two-story section includes two separate rental units (ID’s 20126 and 20128), each with a private entrance, private patio, and gas grill. 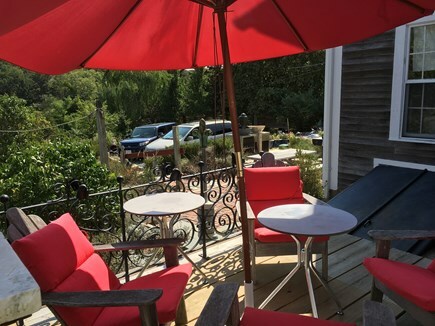 Guests in either apartment find themselves in a peaceful village setting that is a short drive to three Truro ocean beaches and the Highland Golf Links... a location which is also approximately a 15 minute drive to both Provincetown's and Wellfleet's restaurants, art galleries, shops, and entertainment. A three-bedroom apartment, ID 20126, comprises the front half of the two story wing of the Millstone. The first floor includes a living room/dining room with cable TV; a master bedroom with queen size bed and two walk-in cedar closets, adjoining a full bath with shower stall, vanity, and toilet; and a fully-equipped galley kitchen (gas stove and oven, microwave oven, dishwasher, double sink, and complete dishes and cooking utensils, plus a new Samsung clothes washer and dryer). 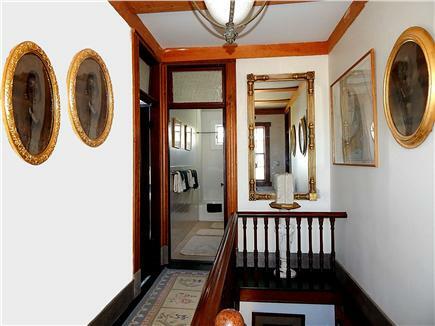 The original stairwell leads up to two second-floor bedrooms -- one with double bed, one with twin beds, and each with a small closet -- as well as a full bath with tub and shower. 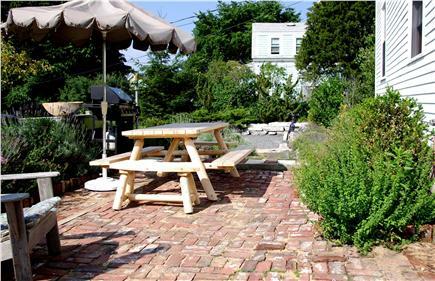 A brick patio, adjacent to the front entrance and overlooking the grounds, is for the exclusive use of this apartment. This is a Sat. to Sat. rental during July and August. Weekly stays in the off season can start on any day. Additional pricing info: Off-season min. 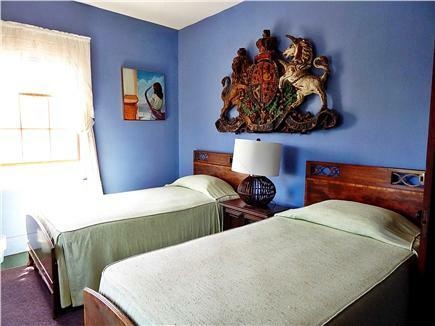 stay 3 nights at $175 each, with additional nights at $125 each, State and local taxes of 12.45% will apply. What a lovely, lovely time we had here. We flew out from England for 3 weeks to visit family and booked this apartment for a week of our stay. We couldn’t have made a better choice. Sam and Scott made us feel so welcome and were most eager to ensure we were comfortable and happy – which we were. We loved: the space and position of the apartment; the local beach (a few minutes walk down the road) and Truro village; Provincetown (hugely interesting and a quick and easy $2 trip on the bus, or one day we walked 6 miles along the beach to it); Head of the Meadow Beach (wonderful waves and seals) and our most interesting, kindly and friendly apartment owners (many thanks to them). Spent a wonderful week at Sam and Scott's beautiful Inn. 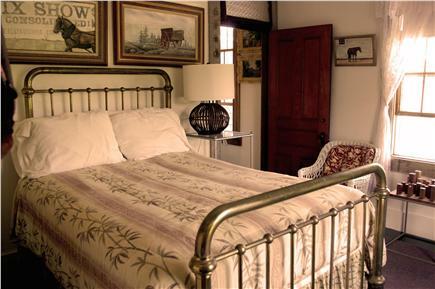 So comfortable and inviting, the unit was decorated with antiques and objects d'art. Spent a lot of time on the deck, catching the sea breeze and reading in privacy and solitude. 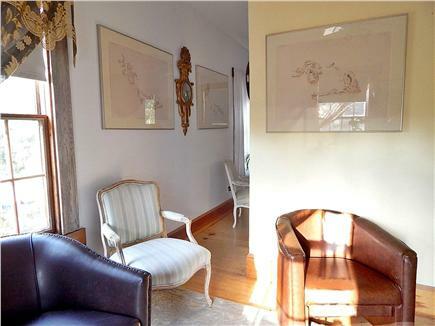 Loved the location, easy walk to beach and short drive to Ptown. Sam and Scott, with Petunia, are perfect hosts. Treat yourself, you will be glad you did. We will be back………. Our 2 weeks stay was very enjoyable. The house is big enough for at least 4-5 people and has everything we need to live comfortably. Very well located, close to several beaches, a grocery store with excellent sandwiches, this is a place that we highly recommend. The owners are charming and very helpful. We will certainly return if the opportunity comes. Merci Sam et Scott pour votre hospitalité ! Stayed at this eclectic, beautiful place for a week, and found true peace. The grounds are beautiful, and the rustic charm, mixed with elegance, made the Millstone a true retreat from the crazy pace of life. A quick walk to the beach every morning was wonderful, and it was only a short drive to P-town. The owners, Sam and Scott, (along with lovely bulldog Petunia), could not have been nicer hosts. I will definitely be back next summer. Many thanks for your wonderful review of Millstone Apartment 20126. It was sincerely appreciated, and we look forward to your next visit! Thanks so very much for your enthusiastic review of the Millstone. We especially enjoyed getting to know your family and are glad you liked the gardens, the herbs, and the new patio table! We also appreciated your suggestion that we provide a written list and more brochures of neighborhood restaurants and attractions, which will be ready for this summer. Please remember us when planning your future vacations on Cape Cod! 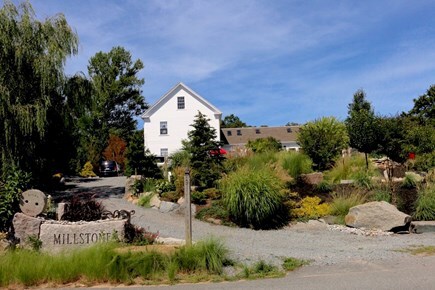 We had a wonderful stay at Millstone. 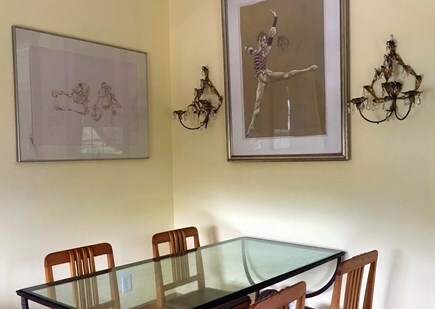 The location is perfect and the host is very gracious. We have been to the Cape close to 15 times over the years, and this is the most comfortable we have been during our stay there. Cold Storage Beach is only around the corner and it is close to everything that we set out to do, be it hitting the beach, shopping, or going out to dinner. The garden is incredible, and there are plenty of antiques that grace the main house we stayed in. Sam & Scott really went out of their way to make us comfortable and were always accessible if we had a question or needed anything at all. We will be making arrangements to stay again next year at this fantastic property ! We have been home only 2 days and already miss it !! We had a wonderful week at the Millstone three-bedroom apartment. The place is well-stocked, and the outdoor grilling/eating space is outstanding. 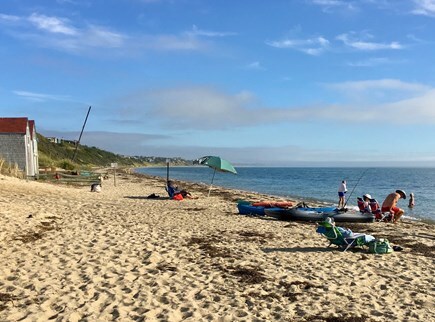 You can't beat the location - walkable to the bay, a VERY short drive to the ocean, and only five or ten minutes into PTown. Sam and Scott were very hospitable, and easy to talk to. And you can't beat their gorgeous bulldog, Petunia! Thank you so much for your review and your high rating of Millstone Cottage! It was a real pleasure to get to know you and your family, and we do look forward to seeing you again in future summers, at your convenience. Our family of 4 had a great time at the Millstone Cottage. The owners, Sam and Scott, were very welcoming. 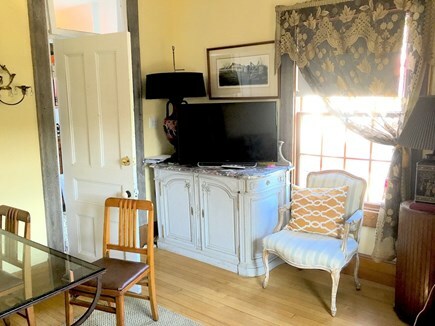 The cottage is ideally situated, close to many of the finest beaches on the Cape, yet secluded enough to have a great night sleep with all the windows opened! We have appreciated very much our living to the Millstone Cottage. It’s a charming and quiet place with beautiful gardens. 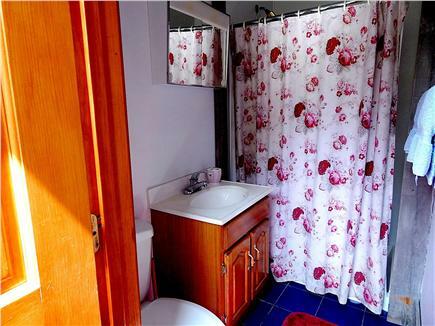 The cottage is comfortable and well equipped. We enjoyed the welcoming/warm experience of the Millstone. The owners are really nice.